I have just read a very interesting post on MindMaps Unleashed about mistakes that are commonly made in Mind Maps. Arjen gives 11 examples which I have summarised on the Mind Map below. We all have made mistakes on Mind Maps and we can all improve our techniques, that’s a fact! I thought that I could Mind Map until I did the Buzan Licensed Instructors course back in January. I learnt a great deal about the theory and the development work that Tony Buzan and others have done over the years to make Mind Mapping the amazingly powerful tool that it is today. What I don’t understand is why so many people don’t make use of a tool that would save them so much time and effort. In Arjen’s article clearly described are the common ‘mistakes’, it’s great to see that other people have seen the same mistakes, I will certainly be using this as a learning tool for myself and for the trainees on my courses in the future. We normally learn by our mistakes and from things when they go wrong. For example when we are learning to ride a bike we don’t just jump on and ride off into the sunset (ok some people do!). We struggle initially to actually lift the bike, then we struggle to get on, balance, pedal and then we realise that we have to stop the bike in a controlled way. In all of those complex tasks we make many mistakes. We have watched others doing and know it can be done but, we struggle for a while until we manage to achieve success. However it does not stop there, we keep going, we keep getting better, faster, more daring and eventually we achieve our goal of being able to ride as fast as we like and have fun! This process is described by Tony Buzan as TEFCAS. Mind Mapping is not different from any other new activity. We try, learn and we make mistakes which have to be corrected to achieve success. TEFCAS. Arjen states that on the day of training, people are really enthusiastic, they are working with like minded people and they are prepared to try different things. They are not standing out and being different. Then they go back home to their work, study or home life and they don’t all continue with the techniques they have spend days learning and money learning. Why? well I guess for some it is because they are going to have to do something which might cause others to question what they are doing, to look across the office and say ‘hey what are you doing with colours and pictures, are you a child?’. Personally I did not let that bother me, in fact It actually gave me the chance to speak to others and spread the word of Mind Mapping. I even did a demonstration on a train once to a student who had been over looking what I was doing and then after she left to some business women! 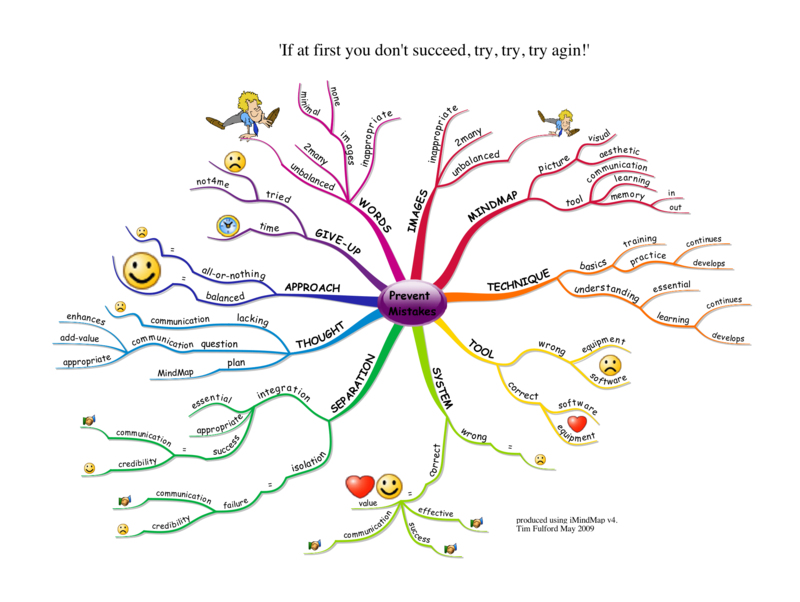 So look at Mind Map below, print it off and learn from the mistakes of others to improve your Mind Mapping. Thank you for transforming the 11 ‘mistakes’ into this colorful mindmap. It seems that it is up to the people who really USE mindmaps to assist those who are trying to create maps. I am really impressed by your site Arjen, it is great and I will be looking to see what you are doing too. Yes it is up to us who can mind map to ensure that we support those new and who are learning. Thats my goal in all my mind mapping work, whether be with children or adults. Thanks for you comments and support, you are a star! The same can be said of many an inspirational training course. Great on the day, still buzzing into the next week and then gradually the enthusiasm fades. To sustain the effectiveness of training in schools I am supporting the development of coaching cultures and learning networks. These are both a great way of making individuals accountable for following through on the actions from learning and ensuring that the learning is cascaded to other staff members too.